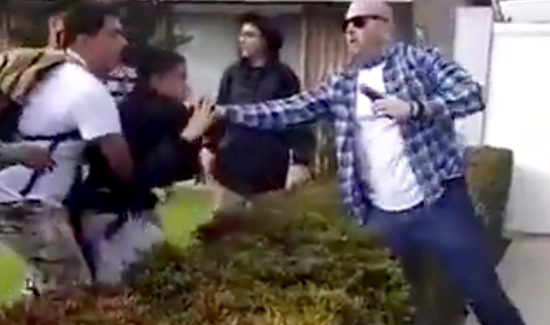 An off-duty Los Angeles police officer on Tuesday fired his weapon during a confrontation with a group of male juveniles after a physical confrontation with a 13-year-old boy, KTLA 5 reports. Anaheim Police Sgt. Daron Wyatt said no one was struck by the gunfire; police later arrested two of the boys, one for making criminal threats and battery and another for assault and battery. The Orange County District Attorney’s Office rejected the charges. No charges were filed against the officer. The officer later fired his weapon. Sgt. Wyatt said the confrontation began over an “ongoing issue” with the kids walking across the officer’s lawn, which culminated in a verbal threat against the officer and prompted him to draw his gun on the child. LAPD spokesman Capt. Andy Neiman said the department has launched an internal investigation into the incident, which he described as standard procedure when an officer fires his gun. “We will continue to conduct the internal investigation to determine the actions of the officer and the circumstances, and then we’ll consult with the Orange County district attorney as well to determine if there’s any issues,” Neiman said.